What’s New in Nail Anatomy? The Latest Facts! April 2019: The Internet is filled with confusing and competing misinformation about nail anatomy. I’ve been on a multi-year quest to determine all the facts but finding them has been very difficult. Many doctors and scientists are also confused by the various “schools of thought.” To get to the root of the issue, I’ve worked with many world-class medical experts and internationally known nail educators, in addition to reviewing dozens of scientific reports. I’d like to explain some new information in hopes of ending the confusion. It is agreed that the proximal nail fold (PNF) is the entire flap of skin covering the matrix, extending from the edge of the visible nail plate to the first joint of the finger. However, there is continuing disagreement about the eponychium. I’ve researched all sides of this debate and I hope this information will clear up confusion. Eponychium literally means “upon the nail”. This is the tissue that covers the new growth of nail plate. Why is there so much confusion about the location of the eponychium? Here’s why. Strangely, in some medical literature, another type of tissue is also identified as eponychium, which creates confusion. Of course, it is confusing with two different types of tissue having the same name. The eponychium creates the cuticle and covers the new growth of nail plate, this other tissue does not. To avoid confusion, we should only refer to the eponychium as the underside portion of the proximal nail fold that covers the new growth of nail plate and creates the cuticle. The eponychium is a thin section of tissue found on the bottom side of the proximal nail fold. It is surprisingly thin- approximately 0.1-0.15 mm thick (0.004-006 inches)—and consists of only one layer of the stem cells (described below). The eponychium extends from the nail matrix to the front edge of the proximal nail fold. Not surprisingly, the nail matrix also contains stem cells, but their job is to make the nail plate. There is only one type of cuticle tissue—the thin, colorless layer of dead tissue that adheres to the nail plate. This tissue comes from the eponychium. The cuticle becomes strongly adhered to the nail plate while it is still located underneath the proximal nail fold. The cuticle then pulls away and continues to ride on the upper surface of the nail plate as it grows outward. How can such a thin layer of tissue produce so much cuticle? Researchers believe this thin layer contains specialized stem cells which are factory-like cells designed to work 24/7, continually creating ever more cuticle tissue. It is important to understand that the cuticle tissue comes from the underside of the proximal nail fold. For clarity, I labeled this area as the location of the “Stem Cells in the Eponychium Layer”. 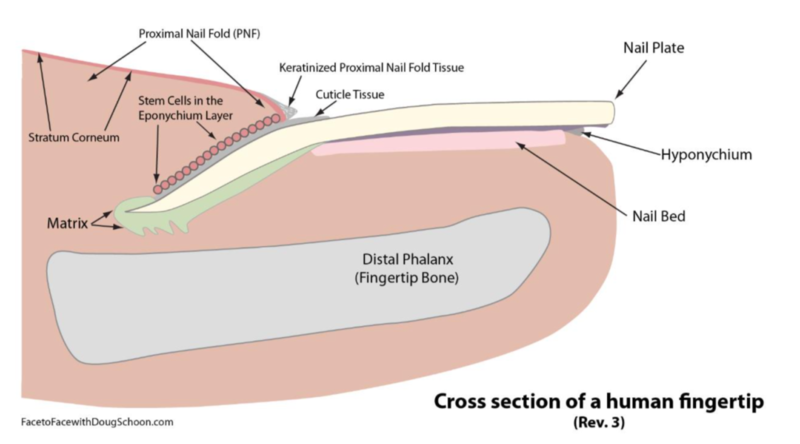 Another interesting part of the proximal nail fold is the area where this living tissue meets the nail plate (see diagram). Unfortunately, many still confuse this area with the cuticle. It is NOT, so please avoid making this error. Here is why some are confused. The outer layer of the proximal nail fold is covered with tissue called stratum corneum, which is also typical of other parts of the body. The area where this skin meets the nail plate has a different appearance because its surface has become keratinized. In other words, just the outer layers located at or near the surface undergoes a process that causes the “surface cells” to produce more keratin. This keratinization process hardens the PNF (proximal nail fold) surface and gives it a slightly different appearance. Like protective armor this hardening surface layer creates a protective shield that can resist attack by infectious organisms or potentially harmful chemicals. 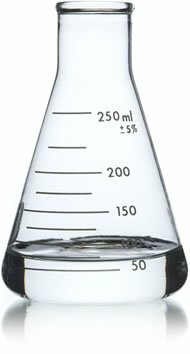 The keratinized PNF remains a relatively thin surface layer, until the PNF is chemically attacked, physically abraded/cut or injured. Then the surface layer becomes thicker and harder. Why? To build up greater protection against any further abuse or injury. The PNF hardened surface skin is NOT the cuticle tissue. The cuticle is softer and much stickier, having superior nail plate adhesion. The cuticle and the keratinized PNF surface layer are made by different types of tissues that are found in different locations. These tissues serve different functions. Don’t confuse them. The cuticle forms an important seal between the PNF and nail plate—preventing infectious organisms from getting underneath the skin to infect the matrix or bone. The keratinized proximal nail fold surface layer helps provide extra protection to the “front edge” of the PNF. In short, the eponychium is a thin layer containing stem cells that lines the bottom of the proximal nail fold. And, proximal nail fold is the correct name for the flap of skin that covers both the nail matrix and nail plate. The cuticle tissue is created by the stem cells located within the eponychium (underside of the PNF). Also note, the nail plate, sits on top of the nail bed, so it is an error to say that nail polish is applied to the nail bed, instead it is applied to the plate. Final Thoughts: The proximal nail fold is NOT the cuticle! It may be covered with hardened PNF skin, but this should never be confused for cuticle tissue. The cuticle tissue is an important barrier (seal) between the PNF and nail plate, that helps keep bacteria out of the nail matrix area. An infection in the matrix area could lead to permanently damaged nail plates and/or bone infections which could lead to the loss of a finger or toe. Cutting and overly aggressive manicuring/pedicuring this area can break the tissue seal to allow bacteria to penetrate and cause a nail to become infected. That’s why it is so important to carefully manicure/pedicure these areas. Carefully removing a loose tag of dead skin is acceptable, as long as the living skin is not torn or damaged further by the removal process. Even so, nail technicians should not intentionally abrade or cut intact skin from around the nail plate. Some might mistakenly believe that since its “keratinized”, it must be dead and not harmful to cut—but that is incorrect! Whether living or dead isn’t the issue. Can cutting or abrading cause skin infections or allergies? Yes! That’s the real issue. The underlying tissue contains microscopic capillaries which are often broken when the PNF tissue is cut or when abraded by an e-file. Infectious organisms can now gain access, entering the skin though this damaged tissue, leading to potentially serious infections. Also, allergic reactions to artificial nail products are much more likely when repeatedly exposed to damaged, cut or abraded skin. It is NOT in the client’s best interest to intentionally cut or abrade away portions of the proximal nail fold. Please help clear up the confusion and share this information widely. Be sure to know the difference between these terms and use them properly. Teach your clients and other nail professionals the truth. It’s time for the confusion to end. It’s critical for everyone to know and teach the facts. You can get much more information from my three-part book series, “Face-to-Face with Doug Schoon”, Vol. 1-3. Each book is very different and crammed with essential information that all nail technicians should understand in order to work properly and safely. Don’t be fooled by myths and misinformation or marketing exaggerations. Get the facts from a scientist who knows them. Learn more about how nail products work, and why they sometimes don’t work. All three books are available world-wide on Amazon, iTunes, Kobo and Nook as either a printed or e-book. Read them all- you’ll be amazed by what you will learn. Doug Schoon is a leading scientific researcher specializing in the Science of Keratin; including Nails, Hair and Eye Lashes. You can learn more about him at www.SchoonScientific.com.